The Organized Connection » Look forward to a ‘De-cluttered’ and an Organized New Year in 2012! Look forward to a ‘De-cluttered’ and an Organized New Year in 2012! Have you every felt a bit of envy- or even guilt- when you see one of those people who are so darn organized? They seem to know where to locate just about everything. They never lose things. They are efficient, and always prepared. In addition, they seem to have less on their minds. In general, they are less scattered in their heads- and in their offices or homes. They even have more time and a lot less stress. Well, for some- they were born that way. For others, they work at it until it becomes a habit, or a part of their daily existence. They strike a balance that works in their life. The GREAT NEWS is that in 2012, you can learn how to be that balanced individual! 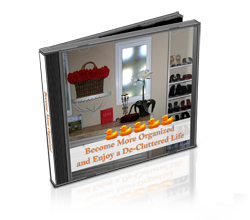 You will be given explicit and detailed direction on how to be organized and de-cluttered- in your home, your office, and even in your head! Just follow through the simple suggestions that will be given to you several times a week and the positive results will follow! Better yet- COMMIT here. Be a part of the organized and de-cluttered wave! Sometimes by putting it out there, it’s a little easier to follow through- and be accountable! Here’s to an Organized 2012! Missy: I really love how your book lists different (small) things to tackle, day by day! It makes my long list of things to organize seem doable. Delia- Thanks for the comment. For most people, realistically, this is the approach to take. Otherwise, as you probably know, it is too easy to get overwhelmed. I’m so ready for this year to begin. For the last two years I’ve pared down most of my stuff. Now containers and book shelves. Welcome to an organized life! You are the first to commit- which is a great sign for you! Hang on, and let the fun begin! I’ve really been going through what I need and what I want. It creates such space to let go of the things that I don’t need and only hold onto for sentimental reasons. I’m ready to move on. I’m excited about what 2012 has ahead of me. I plan to take control and seize all opportunities to be organized and will set myself up for success. I am looking forward to learning how to adopt the organizing more for my business. I do have some good systems and even though I am one of those born organizers, I’m definitely always open to learning how I can make things even better!! I will share this with others that could use the help as well. Thank you!! Great to re-connect again! Looking forward to getting organized again, create more free time & fun. Looking forward to reading your blogs. Thank you for sharing your info with us! You know, this is such a huge challenge for so many, I think this would be a good topic for one of my radio shows. What do you thinnk? This is an excellent topic for radio shows. People are in need of help and guidance in this area. Please let me know if you’d like to schedule a date. I could also send you some podcasts I have done. I am a cancer survivor and have been sick with different things since. I now have Rheumatoid Arthritis. I used to be neater/cleaner about my home when I was working. Now that I am disabled and home all the time, my house is getting so small. I am beginning to feel like a hoarder. I am working on surfaces now, but it just seems like an endless task that I will never be able to fix. It has become overwhelming. When I read your post on my Facebook, it was almost like a lifeline being thrown in the water at a drowning woman. Thank you so much! Thank you for your honesty regarding your situation. You are not alone. I have numerous clients who have similar situations as yours. Hang in there and follow along. Do what you can and celebrate that. We are all in this together. Just checking in to see how you are doing? Thanks so much for your kind words, and the fact that you are checking in! Good for you. Please sign up so you are able to get my updates. Also, check in and let me know how your progress is going. January in Wisconsin – what better time to systematically dissect my house room by room and box by box to purge the old and unnecessary. I started by shredding unneeded receipts and bills, organizing my appliance and household goods instructions binders, organizing my recipes binder, and putting almost 4 years of pictures into albums. During the past few weeks I started work on the basement. Once everything is painted and put back together, I can start to declutter down there, too. First, I needed to get rid of the dark walls and brighten the place up! You are a rock-star! Wow! If you ever move out to CA, I’d love you to work with me! !